Navratri is regarded as one of the most significant and widely popular festivities which is dedicated to worship the nine different forms of Goddess Durga. Navratri i.e. 9 nights is a 9-day long celebration with each day holding a distinct significance. It is a festival dedicated to Goddess Durga and her nine forms. Each day is associated with one form of Maa Durga. The names of the nine different avatars of Maa Durga are Shailaputri, Brahmacharini, Chandraghanta, Kushmanda, Skanda Mata, Katyayani, Kalaratri, Mahagauri, and Siddhidatri. The third day of Navratri celebrations is dedicated to Maa Chandraghanta. 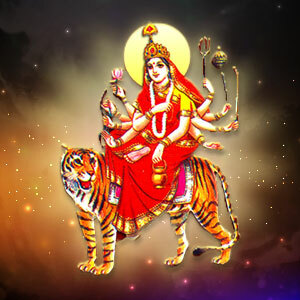 Maa Chandraghanta is the married form of Maa Parvati. Maa Parvati after getting married to Lord Shiva started adorning her forehead with half Moon (Chandra). This is the reason Goddess Parvati came to be known as Goddess Chandraghanta. As per the Hindu beliefs, Goddess Chandraghanta is considered as the third avatar of Goddess Durga who is worshipped by the devotees on the third day of Navratri. She brings tranquility, prosperity, and happiness in the life if worshipped devotedly. She is supposed to have a half moon or a ‘Chandra’ placed on her forehead in the shape of a bell or a ‘Ghanta’. She is believed to be very charming with a golden bright complexion and rides a lion. She is depicted with ten hands. In her four left arms, she carries Trishul, Gada, Sword, and Kamandal and the fifth left arm is in the Varada Mudra. In her four right arms, she carries lotus flower, Arrow, Dhanush(bow) and Japa Mala. The fifth right hand is in the Abhaya Mudra. As per the Hindu scriptures, Goddess Chandraghanta is believed to bestow her devotees with power, bravery and courage. Her blessings can eliminate all the sins, physical sufferings, mental tribulations and hurdles. As per the Hindu Mythology and Shiva Maha Purana, Goddess Chandraghanta is the married form of Goddess Parvati. After the marriage of Lord Shiva and Goddess Parvati, Lord Mahadev adorned the Goddess with a Chandra that was made with ‘Chandan’ and therefore, the deity became popular as Chandraghanta. Goddess Parvati is worshipped in the form of Devi Chandraghanta as the goddess of forgiveness and peace. Chandraghanta puja is performed for the self-purification of oneself. On the third day of Navratri, the puja begins with setting up of an idol of Maa Chandraghanta which is purified with Ganga Jal. Do Kalash Sthapna by placing a water-filled pot of Silver, Copper or Earth. Now, take the Sankalpa for Puja and do shodopchar puja of Maa Chandraghanta along with all other deities with Vedic and Saptashati mantras. Then offer all relevant pujan samagri to all the deities. Finally perform Aarti and distribute Prasad. Offer milk and milk products to Maa Chandraghanta. This makes Maa Chandraghanta happy and she removes all obstacles and ensures peace in the life of the devotee. Get Free Astrology Predictions for Your Life.